Two Buddhist monks have been killed in temple shooting . 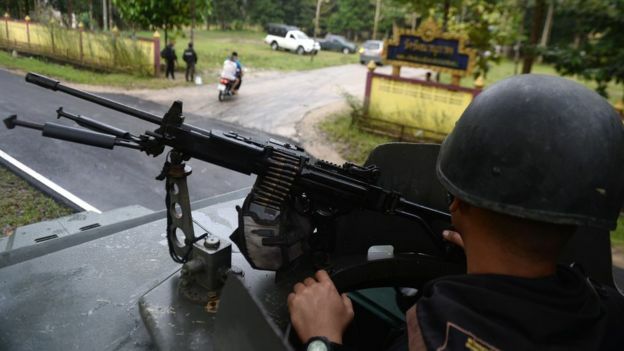 The Buddhist Monks fatally shot and two others wounded inside a temple in southern Thailand. “The cause of the conflict in the south is originally between the government and locals. But this is an attempt to turn the conflict to be between two religions,” she added. She said there are victims on both sides, noting that on 11 January, an Imam was gunned down. A lack of transparency in the judicial system makes it difficult to assign blame for the violence, said Ms Pornpen, who also heads the Cross Cultural Foundation, which monitors and documents cases of torture and ill-treatment. Prime Minister Prayuth Chan-ocha condemned the violence and ordered security officers to find the culprits, said government spokesman Puttipong Punnakanta.